Sony has just unveiled two new additions to its Xperia line up; the 6-inch phablet Xperia X5 Ultra, and the Xperia M5, which the Japanese company is billing as a "super mid-range" phone. The phrase "super mid-range" at first seems a bit like saying something is extra medium, but by the looks of things the Xperia M5 is a pretty interesting handset. It's the successor to the Xperia M4 Aqua and packs a 5-inch 1080p display, a 64-bit 2.0GHz MediaTek MT6795 chipset, 3GB of RAM and a 2,600mAh battery, so it's shaping up to be a decent device. It'll also support 4G LTE, runs Android 5.0 Lollipop, and will be available in single and dual SIM variants. 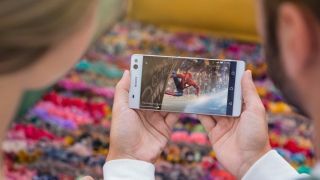 On the other hand, the Sony Xperia C5 Ultra will come with a large 6-inch 1080p display surrounded by incredibly thin bezels that will keep the handset from feeling too large. Another MediaTek SoC will be included with an octa-core CPU running at 1.7GHz, backed up with 2GB of RAM and a 2930mAh battery. Selfie snappers look set to be impressed by the C5 Ultra, with the 13MP front-facing camera coming with a 2mm focal length and an 88 degree field of view, which means you'll be able to fit in a group of your friends (as well as come scenery) thanks to wide field of view. The rear camera is another 13MP affair, with a 25mm focal length and 80 degree field of view. Again dual and single SIM variants will be available, and the C5 Ultra will go on sale mid-August in select countries. We haven't heard when the Xperia M5 will be released, but we're chasing up with Sony to find out when we can expect its mid-range wonder.